Welcome! – The Chrysler Connection is a online world-wide, community dedicated to the preservation, restoration, and enjoyment of Chrysler brand vehicles. The connection was built to promote member sites of the Mopar Enthusiast Ring specializing in Chrysler brand vehicles and topics. Types of member sites include Chrysler 300, Cordoba, Pt Cruiser, Sebring, Newport, New Yorker, Town & Country sites and more. Cruising the connection is a great way to locate Chrysler related information, web sites and owners on the internet. We are a proud group of automobile enthusiasts with a common interest of preserving and enjoying our classic and modern Chrysler vehicles. 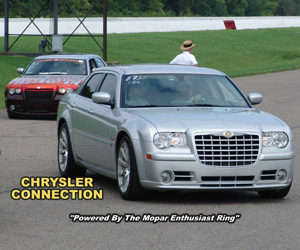 The Chrysler Connection Member list is 100% comprised from member sites and pages of the Mopar Enthusiast Ring. Hand picked by the Ringleader, only member sites with pages or resources devoted to Chrysler brand topics are considered. The Connection also features a great link section to other non member Chrysler resources. Have a Chrysler brand vehicle web site or page and want to get listed? The Connection is a great resource for promoting your site or page To be considered for the list you have to be a member of the Mopar Enthusiast Ring in good standing. Joining is totally free and is a great way to get more people to visit your Chrysler site or page. For more information on joining visit here. Over the years many vehicles have been produced by Chrysler, the first was introduced in January 1924 at the New York Automobile Show. The 1924 Chrysler Six was priced at $1,565 and featured two significant innovations, a light, powerful, high-compression six-cylinder engine and the first use of four-wheel hydraulic brakes in a moderately priced vehicle. The well-equipped Chrysler Six also featured aluminum pistons, replaceable oil and air filters, full-pressure lubrication, tubular front axles, shock absorbers and indirect interior lighting. The Chrysler Six was a hit and sales during its initial 18 months enabled Walter P. Chrysler to establish the Chrysler Corporation on June 6, 1925. Within 3 years Chrysler would become the fourth largest automaker in the United States after Ford, General Motors and Hudson. More than 80 years after the creation of the company, Chrysler continues to offer vehicles that personify Walter P. Chrysler’s original vision for the brand bearing his name: superb engineering, standout design and fun-to-drive performance all at an affordable price. The Chrysler Connection is part of the internets oldest and largest Mopar Enthusiast Ring, featuring over hundreds of Chrysler, Dodge, Dodge & Ram Truck, Plymouth and Mopar sites and pages. Including a collection of Mopar related Clubs and Parts & Services sites. The mopar-ring.org server also hosts some other cool Mopar related resources. Including a Classifieds section, Photo Gallery, Screensaver section and a news section.